Work has been progressing on all fronts on Night Mail over the winter and into the March. We have been in talks with the British Postal Museum and Archive and can now announce we are taking custodianship of two vehicles. The first of these is a travelling post office, but not of a rail kind! It is in fact a Mobile Post Office (MPO) road vehicle. This Commer Karrier unit and trailer were built in 1971. They will have a garage built around it to protect it from the elements and will be used not only as an exhibit, but also a shop and display. For more information about the vehicle, click here. 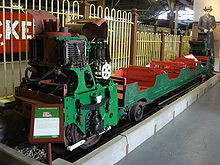 The second vehicle is a rail vehicle, but from a railway that most people had never heard of, and even fewer have seen in operation. The 2ft gauge London Post Office Railway ran in tunnels underneath London between Paddington and East London, beyond Liverpool Street. The line operated between 1927 and 2003.The electric railway carried no passengers, had no drivers or gaurds, but at one stage carried 25 million letters a week. The vehicle itself, number 807, was built in 1930 and has recently been in store with the Post Office Museum and Archive. It will be housed in a separate cabin at Ferry Meadows. The vehicle arrived at the NVR in the last week in March and is currently in store whilst an exhibit is built for the vehicle. The unit consists of two power units joined by a non-wheeled centre car. For more information on the London Post Office Railway, click here or here. Photos of the move and a restored sister unit are below. To facilitate this we will have to move the LMS BG that arrived in 2011 and had been sitting on a separate section of track. The existing siding had the stock cleared, and will shortly be slewed over and the BG moved onto the existing siding. The rail training school we have on site have been extending the siding that will eventually become the second platform. Because this will eventually become a running line it is being done to a high standard using concrete sleepers. Site clearance has also been progressing a lot recently. It is only when the undergrowth has been cleared you can fully appreciate how large the site is.